In January 2007, Guru became the first Indian movie mastered in the DCI-compliant Jpeg2000 Interop format and also the first Indian film to be previewed digitally, internationally, at the Elgin Winter Garden in Toronto. This film was digitally mastered at Real Image Media Technologies in India. In 2007, the UK became home to Europe's first DCI-compliant fully digital multiplex cinemas; Odeon Hatfield and Odeon Surrey Quays (in London), with a total of 18 digital screens, were launched on 9 February 2007. By March 2007, with the release of Disney's Meet the Robinsons, about 600 screens had been equipped with digital projectors. In June 2007, Arts Alliance Media announced the first European commercial digital cinema Virtual Print Fee (VPF) agreements (with 20th Century Fox and Universal Pictures). In March 2009 AMC Theatres announced that it closed a $315 million deal with Sony to replace all of its movie projectors with 4K digital projectors starting in the second quarter of 2009; it was anticipated that this replacement would be finished by 2012. AMC Theatres former corporate headquarters in Kansas City, prior to their 2013 move to Leawood, Kansas. Despite the fact that today, virtually all global movie theaters have converted their screens to digital cinemas, many major motion pictures even as of November 2018 are shot on film. Christopher Nolan also released his latest film Dunkirk in IMAX, 70 mm, and 35 mm in selected theaters across the world. Only four manufacturers make DCI-approved digital cinema projectors; these are Sony, Barco, Christie and NEC. Except for Sony, who use their own SXRD technology, all use the Digital Light Processing (DLP) technology developed by Texas Instruments (TI). D-Cinema projectors are similar in principle to digital projectors used in industry, education, and domestic home cinemas, but differ in two important respects. First, projectors must conform to the strict performance requirements of the DCI specification. Second, projectors must incorporate anti-piracy devices intended to enforce copyright compliance such as licensing limits. For these reasons all projectors intended to be sold to theaters for screening current release movies must be approved by the DCI before being put on sale. They now pass through a process called CTP (compliance test plan). Because feature films in digital form are encrypted and the decryption keys (KDMs) are locked to the serial number of the server used (linking to both the projector serial number and server is planned in the future), a system will allow playback of a protected feature only with the required KDM. In the last ten years this initial offering of the arts has also expanded to include live and recorded music events such as Take That Live, One Direction Live, Andre Rieu, live musicals such as the recent Miss Saigon and a record-breaking Billy Elliot Live In Cinemas. Live sport, documentary with a live question and answer element such as the recent Oasis documentary, lectures, faith broadcasts, stand up comedy, museum and gallery exhibitions, TV specials such as the record-breaking Doctor Who fiftieth anniversary special The Day Of The Doctor, have all contributed to creating a valuable revenue stream for cinemas large and small all over the world. Subsequently, live broadcasting, formerly known as Alternative Content, has become known as Event Cinema and a trade association now exists to that end. Ten years on the sector has become a sizeable revenue stream in its own right, earning a loyal following amongst fans of the arts, and the content limited only by the imagination of the producers it would seem. Theatre, ballet, sport, exhibitions, TV specials and documentaries are now established forms of Event Cinema. Worldwide estimations put the likely value of the Event Cinema industry at $1bn by 2019. A number of high-profile film directors, including Christopher Nolan, Paul Thomas Anderson, David O. Russell and Quentin Tarantino have publicly criticized digital cinema and advocated the use of film and film prints. Most famously, Tarantino has suggested he may retire because, though he can still shoot on film, because of the rapid conversion to digital, he cannot project from 35 mm prints in the majority of American cinemas. 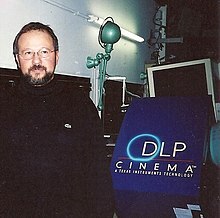 Steven Spielberg has stated that though digital projection produces a much better image than film if originally shot in digital, it is "inferior" when it has been converted to digital. He attempted at one stage to release Indiana Jones and the Kingdom of the Crystal Skull solely on film. Paul Thomas Anderson recently was able to create 70-mm film prints for his film The Master. ^ Leo Barraclough (June 23, 2013). "Digital Cinema Conversion Nears End Game". Variety. ^ "Live via satellite: the first digital premiere | Penn Current". Upenn.edu. 1998-10-15. ^ "D Day for Two Digital Movies as "The Cruise" and "The Last Broadcast" Debut in Theaters Today | Filmmakers, Film Industry, Film Festivals, Awards & Movie Reviews". Indiewire. ^ "The Last Broadcast". Thelastbroadcastmovie.com. ^ Charles S. Swartz (editor), Understanding digital cinema, 2005, p. 159. ^ "SMPTE's Digital Cinema Committee Takes Off Running". MKPE consulting. 2000. Retrieved 2011-10-25. ^ "DIGITAL CINEMA – KEY FIGURES & FACTS" (PDF). 2006-07-23. ^ "Digital Cinema Initiatives (DCI) - DIGITAL CINEMA SYSTEM SPECIFICATION, VERSION 1.2". Dcimovies.com. ^ "Digital movie in Malayalam released". The Hindu. 2006-08-19. Retrieved 2006-08-23. ^ Taub, Eric A. (March 29, 2009). "AMC to Get Sony Digital Projectors". New York Times. New York. Retrieved November 19, 2009. ^ "Digital Screen Numbers and Forecasts to 2015 are Finalised". IHS Technology. January 26, 2011. Retrieved September 1, 2016. ^ Romanek, Neal (2013-02-07). "Inaugural UK Digital Cinema Conference assesses the state of digital cinema | News | Screen". Screendaily.com. ^ Persico, Joyce J. (March 19, 2012). "Newtown's old-time movie house looks for revival in the digital age". The Times, Trenton. New Jersey On-Line LLC. Retrieved 2012-04-07. ^ a b "Cinema Technologies". natoonline.org. Retrieved September 1, 2016. ^ "The ABCs of DCPs: Unwrapping the Digital Cinema Package". Filmjournal.com. 2012-08-28. ^ "DCP-2000 and DCP-2K4 User Manual" (PDF). Archived from the original (PDF) on March 19, 2013. ^ MKPE Consulting LLC. "How Digital Cinema Works: Part 4". Mkpe.com. ^ "Dolby Screen Server (DSS200)". Dolby.com. Archived from the original on 2014-01-01. ^ "DCI Cinema Specification v1.2". Digital Cinema Initiatives. March 7, 2008. Retrieved January 1, 2011. ^ "NATO Digital Cinema Requirements v2.1" (PDF). December 12, 2008. Archived from the original (PDF) on March 26, 2009. Retrieved November 19, 2009. ^ "DLP Cinema Projectors|Christie - Visual Display Solutions". Christiedigital.co.uk. ^ "What is Digital Cinema – About Digital Theater - DLP Cinema Technology | DLP – Texas Instruments". Dlp.com. ^ SRX-R515P. "SRX-R515P (SRXR515P) : Specifications : United Kingdom : Sony Professional". Sony.co.uk. ^ "Samsung Debuts World's First 3D Cinema LED Screen Theater in Switzerland". news.samsung.com. Retrieved 2018-07-10. ^ Frazer, Bryant. Animating a Personal Flash Epic. Studio Daily. May 22, 2008. Accessed on: May 22, 2008. ^ Olivier Bomsel, Gilles Le Blanc, Dernier tango argentique. Le cinéma face à la numérisation, École des Mines de Paris, 2002, p. 12. ^ E. J. Des B. Binwag, Introduction to Data Communications, Saint Louis University, p. 17. ^ "Event Cinema in European cinemas" (PDF). IHS Screen Digest (Report). 2013. Archived from the original (PDF) on May 13, 2014. Retrieved September 1, 2016. ^ Merchan, George (2012-04-15). "Christopher Nolan talks film vs. digital, his take on CGI, his disinterest in 3D, and much more in insightful DGA interview - Movie News". JoBlo.com. ^ "pta on digital vs. film". YouTube. 2006-08-10. ^ a b Galloway, Stephen; Belloni, Matthew (November 28, 2012). "Director Roundtable: 6 Auteurs on Tantrums, Crazy Actors and Quitting While They're Ahead". The Hollywood Reporter. Retrieved November 10, 2014. ^ "Quentin Tarantino: 'I can't stand digital filmmaking, it's TV in public' - Movies News". Digital Spy. 2012-11-30. ^ "Steven Spielberg on Digital Cinema". YouTube. ^ "Digital Projection Mishap Derails Premiere of De Palma's "Passion" at New York Film Festival - EntertainmentTell". Technologytell.com. ^ "Resolution of 35mm film and 70mm IMAX film?". Reduser.net. ^ Laemmle, Robert (2004). The Movie Business Book, Third Edition - The Independent Exhibitor. Simon & Schuster. ISBN 0-7432-1937-6. ^ "2K vs 1080p resolution question [Archive". REDUSER.net. ^ Boxoffice Media, Llc. "BoxOffice® — SONY'S DIGITAL CINEMA MOMENTUM CONTINUES WITH RECORD NUMBER OF 4K PROJECTORS SHIPPED; EIGHT YEARS OF CONTINUOUS GROWTHBoxOffice® — News". Boxoffice.com. Archived from the original on 2013-11-13. ^ "How many pixels are there in a frame of 35mm film?". Technologytell.com. Archived from the original on 2015-08-12. ^ AAM VPF. "AAM VPF". AAM. ^ "Westar Cfec 105 x 35 mm Projection System New Unused". eBay. 2012-04-17. ^ "DLP 3 Chip Projectors". Projector Reviews. ^ "The Digital Dilemma. Strategic issues in archiving and accessing digital motion picture materials". Academy of Motion Picture Arts and Sciences. 2007.